Represents various ChartBar properties configured from the Chart's Data Series menu. Note: The properties on this page indicate what have been configured by the user, and is NOT necessarily representative of what is actually contained on the chart. For example, a user may have a requested 120 days of chart data, however only 60 days of bar data actually returned from their provider. 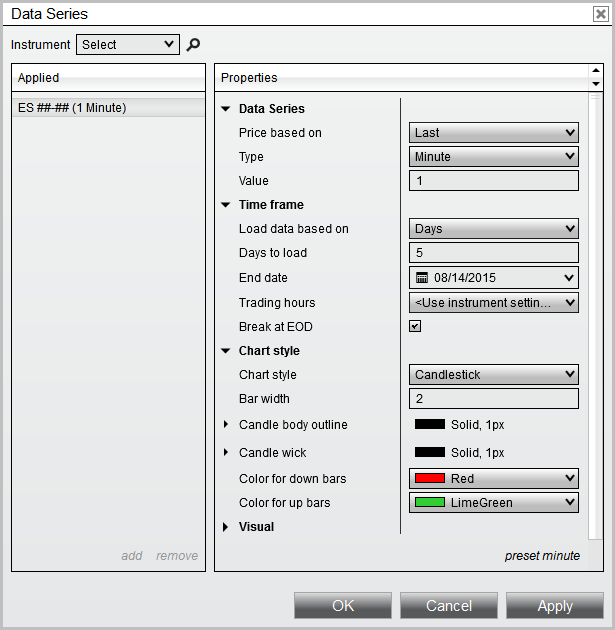 A DateTime representing the Chart's Data Series configured "Start Date" when the RangeType.CustomRange configured. A string representing the configured Chart's Data Series "Label"
A Stroke object representing the Chart's Data Series "NinjaScript strategy unprofitable trade line"
A Stroke object representing the Chart's Data Series "NinjaScript strategy profitable trade line"
A PriceMarker object representing various brushes used to paint the Chart's Data Series "Price marker"